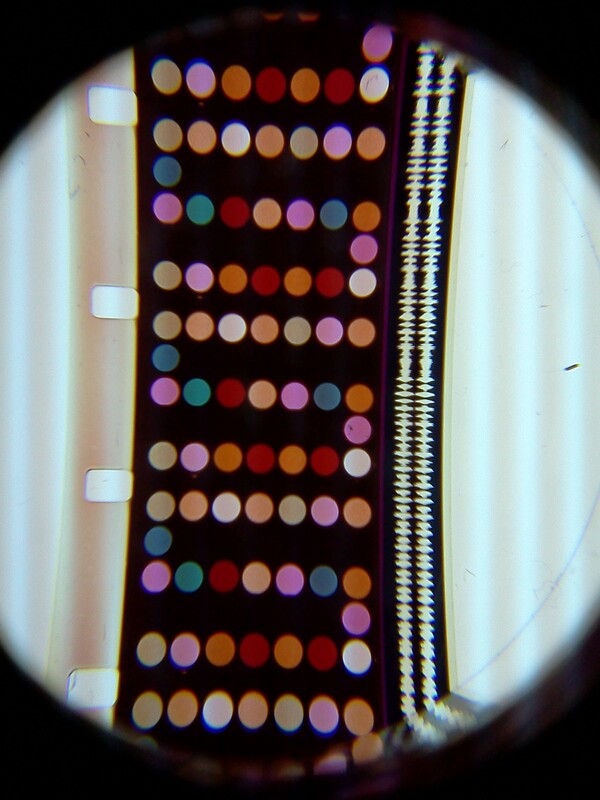 Screen shot from the film “Instant Guide to Synanon” (1973) that is currently being preserved through a grant from the National Film Preservation Foundation (NFPF). The UCLA Library holds a large amount of unique audiovisual (AV) materials. The Library also often creates its own AV content. For example, the Center for Oral History and Research records both video and audio oral histories that must be preserved and made available to researchers at the Library. With new facilities hosting workshops and lectures in the Charles E. Young Research Library, live performance capture is an important new area. To add to this, the entire UCLA campus frequently hosts performances, conferences, talks and sporting events. It is important to point out that the UCLA Library is completely separate from the UCLA Film and Television Archive. AV Preservation within the UCLA Library is relatively new. After much inquiry through an assessment project, “Performance Capture”, led by Howard Besser (NYU), acting as a consultant to the UCLA Library[i], an internal expert was hired. Thus I began working in the Preservation Unit of the UCLA Library in the summer of 2011 to serve as the first AV preservation specialist. My main objectives are: to create a plan for the preservation of born-digital and video capture of performances across campus; to create a small in-house AV preservation lab; and to facilitate larger reformatting projects with professional vendors. As is the case with many places undergoing AV preservation and reformatting, one of the main issues I have been dealing with has been digital preservation and storage. Storing AV material in multiple copies and file states takes up a lot of space that we need to obtain. 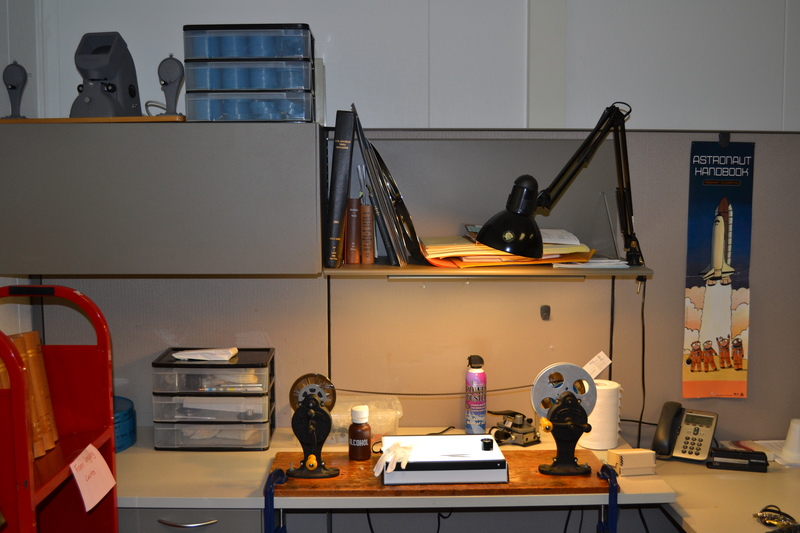 UCLA Library Preservation Unit’s temporary film inspection and repair station is to be replaced with newer and more professional equipment. The Preservation Department intends to build three different stations for AV preservation work. Each will be designed to be scalable in order to steadily increase our capacity. The first will be Station A: Processing and Treatment Room, a secure room where access is limited to a select number of staff. In this room collections and materials will be tracked in a database with accompanying metadata. The items, specifically their old and new containers, will be barcoded to link the physical items to the initial metadata created in the database. Next, the materials will undergo inspection, repair, rehousing, and cleaning if appropriate. The logistics of properly packing, shipping, and receiving items from vendors will also take place in this room. The items that will be reformatted for preservation in-house will move to Station B: Visual Playback and Reformatting Room. For the most part, we have Station A up and running at this point, although the film inspection and repair area will get a face lift in the next month with new equipment. Station B is moving along a bit more slowly. This will be for the preservation transfer of select magnetic tape formats. This set-up will be made scalable so that other formats can be added in the future. It will be housed in one secure room of approximately 120 square feet, the access to which will be limited. Metadata will be embedded in the newly created digital files at this station. Playback of select formats to be determined will also be offered here. Station C is almost ready to start its full operation. It is not in a secure, locked area, although secure authentication using UCLA’s Shibboleth system is in place to control access to digital master files. [ii] We are sharing this space with the Library’s Cataloging and Metadata section. Here trained student workers will take the files created in-house and files received from the vendors, conduct quality assurance checks, and create reports on each file in the tracking database. We are lucky to pool our interns and student workers from UCLA’s Moving Image Archive Studies master’s program and the Department of Information Studies. Other collaborations are planned with various departments in the Library and across UCLA that are capturing events through AV materials. Lastly, AV identification training was given to graduate students in the UCLA Library Special Collections’ Center for Primary Research and Training, which will be expanded and presented to many different departments at UCLA. Starting an AV preservation program from scratch is challenging and time consuming: learning about other places’ successes and failures has been the most helpful to me. I would love to return the favor and discuss these elements further with anyone who has questions or suggestions. [i] A version of the report has been prepared for distribution. Contact Siobhan Hagan, AV Preservation Specialist, to obtain an electronic copy. [ii] Internet2 Middleware Initiative. Shibboleth: http://shibboleth.internet2.edu/ Consulted 14 March 2012. Content by the Media Preservation Initiative is licensed under a Creative Commons Attribution 3.0 Unported License.